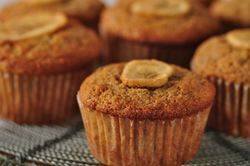 Here is a moist Whole Wheat Banana Muffin that pairs the sweet flavor of mashed bananas with pure maple syrup. It is loosely based on a recipe I found when I was browsing through Myra Goodman's "Food to Live By" cookbook. If you do not recognize the name, Myra Goodman and her husband Drew, are the owners of Earthbound Farm which is the largest grower of organic produce in the world. Her cookbook offers a wide range of delicious sweet and savory recipes that encourage us to use organic foods. So for a little information on ingredients used in this muffin recipe. The fat is in liquid form. Using oil makes the muffins wonderfully moist and tender because oil prevents the development of gluten in the flour. Besides oil, buttermilk is also added, which makes the muffins both tender and bread like in texture. If you cannot find commerical buttermilk or buttermilk powder, you can make a good substitute. Stir 1 teaspoon lemon juice or vinegar into 1/3 cup (80 ml/grams) milk. Let sit at room temperature about 10 minutes before using. Maple syrup gives the muffins an almost caramel flavor and a dense moist crumb. I used Grade A Dark Amber maple syrup and make sure it is labeled "pure". Maple syrup is a reddish-brown aromatic liquid that has a distinctive rich, sweet, nutty, almost caramel flavor. The bananas you use should be ripened bananas. Ripened bananas are bananas which have turned from bright yellow with no brown spots, to bananas which are mostly brown with yellow spots. Brown bananas are great for baking as they are soft enough to mash and make baked goods moist. When making banana muffins you can line the muffin cups with paper liners which makes for easy clean up. Oftentimes, though, I just butter or spray the muffin cups with a nonstick vegetable spray. Whole Wheat Banana Muffins: Preheat your oven to 375 degrees F (190 degrees C) and place the oven rack in the center of the oven. Line 12 muffin cups with paper liners, or you can butter or spray the muffin cups with a non stick vegetable spray. In a large bowl combine the flours, baking powder, baking soda, salt, and ground cinnamon. Stir in the chopped nuts. In another large bowl whisk the eggs until frothy. Stir in the mashed bananas, maple syrup, brown sugar, buttermilk, oil, and vanilla extract. With a rubber spatula or wooden spoon, lightly fold the wet ingredients into the dry ingredients just until combined. (The important thing is not to over mix the batter or the muffins will be tough and rubbery.) Spoon the batter into the prepared muffin tins and, if desired, place a slice of banana or dried banana chip on top of each muffin for garnish. Bake about 18 - 22 minutes or until a toothpick inserted in the center comes out clean. Place on a wire rack to cool for 5 - 10 minutes and then remove muffins from pan. Serve warm or at room temperature. The muffins are best the day they're made, but they can be covered and stored for a few days. Or they can be frozen for about one month. Makes about 12 regular sized muffins.